One of the most difficult tasks during the implementation of a SBC project is to determine the load your environment can handle. Till some time ago there was only expensive software available like Mercury or Scapa that were giving satisfying results. Citrix also had there freeware Citrix Server Test Kit but the product was not really usable. To fill up the gap Daniel Nikolic developed Denamik LoadGen. The software is free to use with 150 users for 180 days, but for more users and days commercial solutions are available. This is the central point for the LoadGen Sofware. The LoadGen is the central communication point. It can install the LoadGen software on the LoadBots and will communicate with the LoadBots to start the sessions and creates the reports. This part can be installed on Windows 2003, Windows 2000SP3+ or Windows XP. Do not install this part on your Terminal Servers. This component is used to create the sessions to your terminal servers for the load test. Installation, configuration and management of these LoadBots is done via the Director. This part can be installed on Windows 2003, Windows 2000SP3+, Windows XP and now also Windows Vista. Subnets of clients are supported by LoadGen. The client for the setting up the session is logically needed on the LoadBot machine. For testing those servers the software is developed, but no software needs to be installed on the Terminal Servers. The 1.1 version supports Citrix Presentation Server, Microsoft Terminal Services and Provision Networks Framework Enterprise. The software is just one single MSI file of almost 7 MB. The installation is just a few next questions, where the only parameter configurable is the destination installation location. In version 1.1 Denamik simplified the way the freeware version can be activated. Personally I really like the new way, because it is much easier to test the product. As already mentioned the LoadBot software can be installed using the directory as described later on this review. Good to mention is that no real installation is carried out, but just a copy of files (and the creation of a service when the loadbot will be activated. After the installation you can start directly the Denamik LoadGen director. The first step necessary for the Loadtest is to have users available to start the Terminal Server sessions with. The creation of this user can be done via the option Virtual User Creation Module. In this module you can create and configure the user settings completely to your needs where the amount of needed users is created in a batch. All necessary settings can be configured like the password, profile path, the home folder, organizational unit, LoadGen Profile and group membership. The tool can also create the home folder, organizational unit and Exchange mailbox for the users. Really useful option for a uniform, quick and simply way to make the users available for the test. By specifying the domain (and a user with the necessary rights in Active Directory) LoadGen support another domain that the Director resists. A profile exists of a configuration that can be run during the Loadtest. Here you configure the amount and which users will be used in the profile and to which Published Application/Desktop they should connect with which settings. Activated Profiles will be used when the Loadtest will be performed. The profile can be tested out of the director's console to check if it's functioning. I noticed that it for connecting the old connection style for Citrix sessions (UDP) is being used (will be changed in the next release). Here you need to configure the users which have enough right to install and configure the LoadBots (local administrator rights on the machines). If you have several users or more domains/workgroups you can add more administrator as necessary. Within this component you manage the machines that will create the sessions during the Loadtest. First you need to add machines. LoadGen will automatically scan (the configured) domain or workgroup for machines that can be used as LoadBot. By specifying the corresponding LoadBot administrator the LoadBot will be automatically installed and configured. Also LoadBots can be selected to participate in the LoadTest (activated). During the activation some of my LoadBots give an error about this process but were activated and useable during the Loadtest. 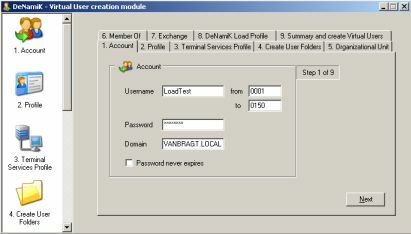 Here you can configure the way your Loadtest will take place. You can configure multiple phases in which you can specify the number of user that connect simultaneous and the interval before the following set of users connect to the environment. This really starts the Loadtest with the configuration you created above. When you run the load scenario the activated LoadBots will be contacted to start the session with one of the user accounts. During the test the progress and some results will be presented to you. You can see the LoadBots being used with their status and the total time duration of the last number of users. At this moment LoadGen only the Loadtest exists of creating a session on your Terminal Server. If you want more actions for example starting applications and/or using the application additional scripting (and logging) is needed right now. Denamik is busy right now with developing an free add-on to record user activity and to save that as an AutoIT script. When the load scenario is finished reporting is available in the Load Reporter option. The report is a little bit summarily. 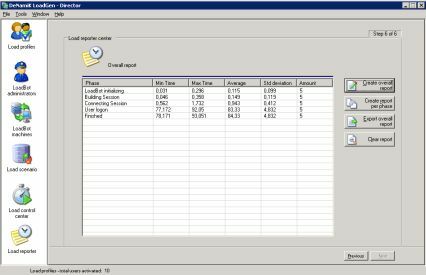 For five steps in the Loadtest the maximum time, the minimum time, the average time, the standard deviation and the total amount of sessions is displayed. Although this report is good starting point, probably you want to have more information about the loadtest. When exporting the reporting a CSV file is created where also the same information per session is displayed. As already mentioned you could script additional steps and logging for application usage. Also a good thing is to use Performance Monitor (or equivalent) to monitor the usage of the system resources and compare those with the data in the CSV report. The market of Loadtest products was for a long time a static market with just a few products with a pretty high price. With LoadGen Denamik opens this market with a 150 free user version and competitive prices for the commercial solution. The current version lacks the possibility to monitor user activities after the session initiation, but Denamik is already busy to add this functionality as a free add-on. Therefore some additional scripting is necessary, but also the other products have the same activities. Reporting could be extended. I personally would be very pleased if resource usage could also be added into one report. The product is also pretty unique because it now support (besides ICA) also RDP and Provision Network Framework sessions. The only uncertain factor for a big success for LoadGen is the way Citrix will position (and license) the ThinGenius TLoad product, which they acquired in March 2007. Free Add-on will become available for application usage recording and reporting. Some small errors and way of connection details while using the product.